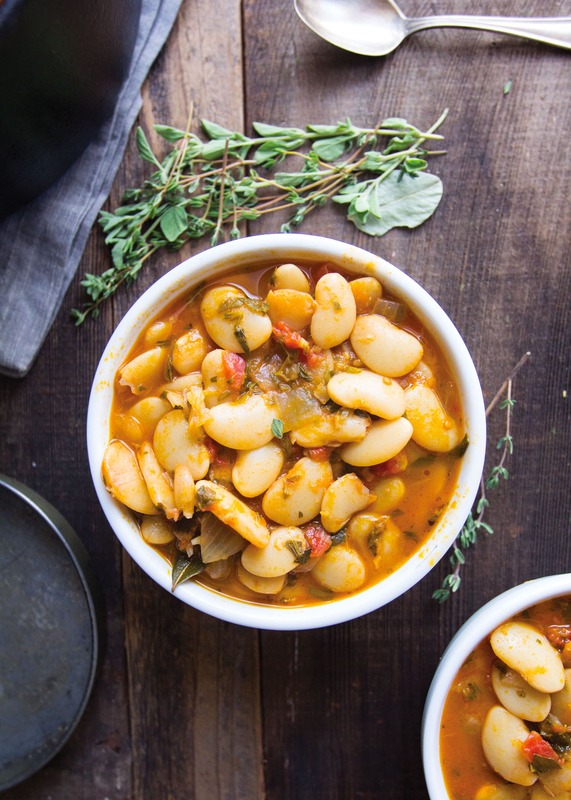 Beans slowly simmered with tomatoes, onion, garlic, and an array of seasonings result in an extremely satisfying gluten free side dish that pairs beautifully with sausage, grilled fish, or roast chicken. Place the beans in a large pot with a lid and add water several inches to cover. Soak overnight, or to quick soak, bring to a boil, simmer for 5 minutes, and let stand for 1 hour. Drain. In the same pot over medium heat, warm the oil. Add the onion and cook, stirring frequently, until soft, 6 to 8 minutes. Add the garlic and cook for 2 minutes longer. Stir in 3 cups water, the beans, the wine, tomatoes, vinegar, parsley, oregano, thyme, paprika, and bay leaves. Bring to a boil, reduce the heat, cover, and simmer for 1 hour. Add 2 teaspoons salt and continue cooking until the beans are tender, 1/2 to 1 hour longer. Remove the lid and cook until the liquid has reduced and the beans are saucy but not watery, about 15 minutes longer. Remove the bay leaves, season to taste with salt and pepper, and serve.